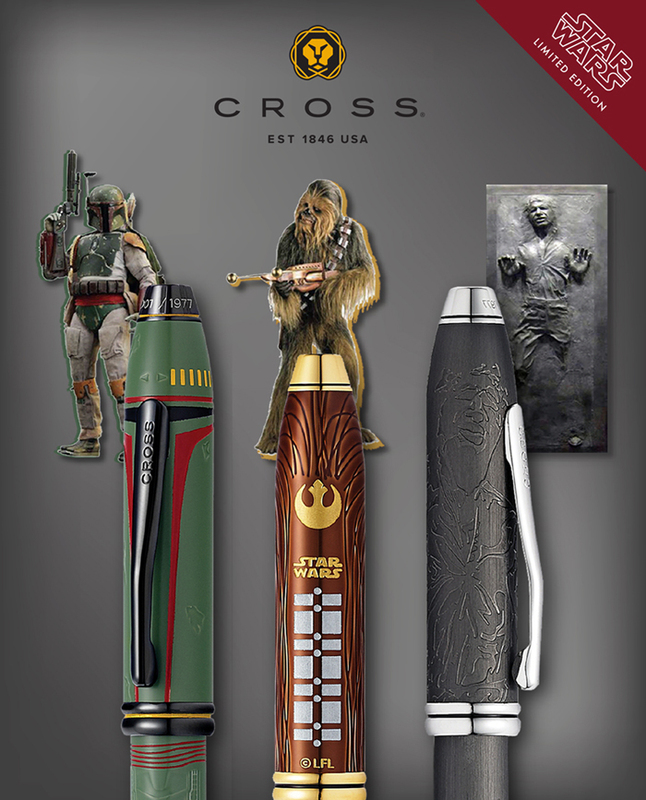 Commemorating the original 1977 film, Townsend Star Wars writing instrument brings the Boba Fett, Chewbacca and Han Solo to life with deep-etched engravings. Presented in a luxury gift box with an included Star Wars themed pen stand, this writing instrument is a unique luxury and the perfect gift for any avid Star Wars fan. Boba Fett Edition — Townsend Star Wars writing instrument brings infamous bounty hunter, Boba Fett to life with deep-etched engravings on an army green lacquer with polished black appointments with a gun-barrel design embedded in the cap. Presented in a luxury gift box with an included Star Wars themed pen stand, this writing instrument is a unique luxury and the perfect gift for any avid Star Wars fan. Limited Edition Worldwide 1,977 x individually numbered pens made. Chewbacca Edition — Collection brings loyal Chewbacca to life with deep-etched engravings on a translucent mahogany-brown lacquer with an embedded brilliant-faceted Swarovski® smoked topaz crystal. Presented in a luxury gift box with an included Star Wars themed pen stand, this writing instrument is a unique luxury and the perfect gift for any avid Star Wars fan. Han Solo Edition — Brings sly scoundrel Han Solo to life with deep-etched engravings on a gunmetal grey PVD plate finish symbolising the carbonite he was trapped in. It’s accented with rhodium-plated appointments and a brilliant-faceted Swarovski® jet hematite.